It's always a drag when your cat always jumps through windows, ceilings, chimneys or scratch doors just to let you know that they want to go out. It's lucky enough for you to be around to open up an outdoor access but what if you're not home? What if your cat wants to go out and do their business? You may have the best cat litter box but it can't really keep your pet from naturally wanting to go out to nature's calling. The best way to utilize your home pathways would be installing the best cat door to provide them easy and quick, indoor/outdoor accessibility. Things would be a lot easier for you and your pet cat if you have a cat door. It will provide them the right amount of space to pass through. Unlike normal door that you need to keep open, cat doors are designed for cats. Pets and other animals larger than a cat would have a hard time fitting through. Smaller types of pet can pass through but it just takes minor adjustment to the height of the door to prohibit other critters from jumping through. Cats on the other hand can jump high where installing the door on an elevated angle would bear no problem for your pet. The idea is to give your pets the accessibility they need while keeping them safe from predators. It is also non-risky cat equipment like your cat scratchers, cat toys, etc., that could put your home's safety and security in harm’s way as intruders will never fit through. 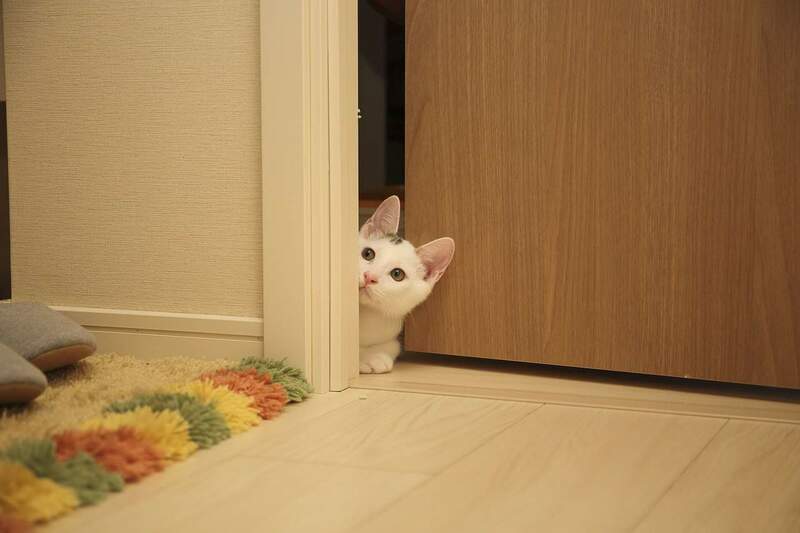 Hands can pass through cat doors wouldn't be able to reach the door handle even if they're persistent in doing so. It's one of the best and practical investments for your cats where you'd really make a change and improve your pet/owner relationship and environment. How will a pet or cat door allow my pet access in and out? Thickness of the house door and the pet door varies? Will it be able to work with a sliding door? Does pet door have locks? Can it be used for different type of animals other than cats? 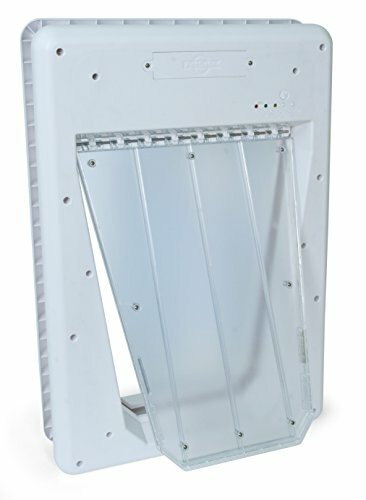 PetSafe Extreme Weather Pet Door, Energy Efficient Pet Door for Dogs and Cats, Small, for Pets Up to 15 Lb. This 4 way locking cat door is our best and top pick due to its design's simplicity. It requires a very basic installation skill. The design may be simple but it features a durable, strong and long lasting door to keep your pet safe, secure and have accessibility. It's rain proof. Exterior seal makes it highly resistant to rain. Poly Carbonated doors for smooth and durable pathways. 4 way lock system for full-proof security. It has trimmable door which makes installation eas​​y and neat. Features brush strip that reduces noise and energy loss. The simplicity makes it easier for you to check and assemble the cat door. The poly carbonated transparent doors allows you to see the other side of the door. Rain won't get through the opening. Cats could easily identify it as a pathway inside and out. Once installed, you can easily and intentionally remove it but would be hard for cats and other animals to do so as it locks in place tightly and securely. It's not a good choice for people who want to have an advance, technological feature such as automation or monitoring. The cat door is very simple which means the features are fairly basic. The poly carbonated doors seems highly breakable if cats frequently pass through. 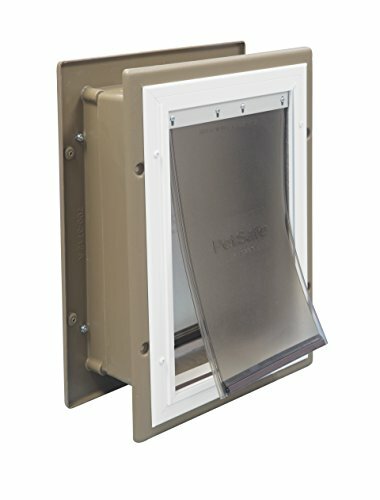 Moving on to our second pick, this is an extreme weather pet door from PetSafe. The set comes in various sizes. It's actually more of a pet door rather than a specific cat door. You can vary the door size to your pet. Medium to large doors would work best for dogs and small size would go appropriately for cats or for puppies. That makes it one of the best is the versatility of the product. Rather than focusing on a single, specific pet, it would be better if it can work for both or several pets at home. Unique Three-Flap Doors reduces energy loss. It's proven to be more efficient than two or single flap doors. The door uses a Snap-on Close Panel which allows you to let your pet or keep them from passing through the door. It has a simple, repaint-able frame that allows you to match it accordingly to the color of your door or depending on your preference. Easy to install. It includes a complete guide of hardware installation, cutting template and detailed step-by-step instruction. Small size are best for pets under 15 pounds, medium for pets under 40 pounds and large for 100 or less pounds. The center part of the door has an insulated flap that helps keep room temperature. It works great for different weathers. The product is flexible in terms of the type of pets it could cater. It will save you trouble from making different doors for specific types of pet you have at home. Plastic frame of the door can be easily repainted if you want a change in color apart from its simple design. The door is well-insulated which means that it keeps either cool or warm air inside. It makes the best door for different weathers. It's available on different sizes. Compared to other products which has only one standard size. This door gives you a chance to vary the pet door size, actual door size and the size of your pet. The product company offers customer support through chat, email or even more, calls, 6 times a week from Monday to Saturday. Basically the product's versatility would remove some of the possible features that could apply for cats rather than making it universal. Most of its parts, including the frame are made of plastic which means overtime use for a short period of time will break some of its parts. The pet door uses a simple lock system making it less secure for animals breaking in and out. The PetSafe pet door being the second choice on the previous design makes this product the third choice given our editor's rating. The pet door is made from aluminum rather than the usual plastic door. This simply means that the door is highly resistant to possible damages from pet stress and behavior. It also has a neat and elegant design and color that could go well unto any interior home door designs at home. The body and the frame of the door is made from aluminum. It's resistant scratch, pet damage or weather damage. It has a double-flap door designed to keep the room well insulated or in a controlled temperature. The door is energy efficient. It highly reduces energy lose and maintains a silent movement as the pet passes through. It could cater to the needs of access of different types of animals, dogs, rabbits, cats, etc. There are three sizes available ranging from small, medium to large. The sizes have some varying pet weight limit where small is intended for pets with 15 pounds or less, medium for 40 pounds or less and large for 100 pounds or less. It's from a brand that is popular in the US for producing different pet equipment from containment, lifestyle, behavior, cat collar and more. Compared to other pet or cat door products, you'd seldom see an aluminum built door that is guaranteed to last and resist strong and heavy damages. It requires easy installation. This can also be used in different types of walls such as stucco, bricks or siding. It literally has the same design like with PetSafe plastic pet door. It also contains most of its features apart from the other being plastic and the other made from aluminum. The change in material makes it more expensive compared to a plastic pet door with the same features. Having the same construction design, the lock system still needs some improvement. 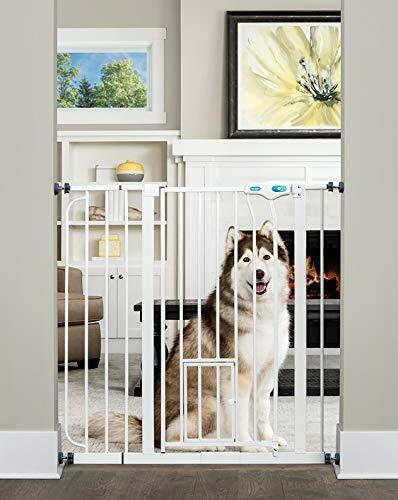 Here's an amazing pet gate and door from Carlson. It is a containment gate for pet with small doors for smaller pets such as cat and more. It's not like your usual pet door that needs installation to your actual home door. This is more like restricting your pet from accessing the area and leaves a small pathway for your cats. It makes great sense as most cats mixed with other home pets such as dogs would want to have a private area to do their business. A good example would be installing this gate to the area where your cat's litter box is located. This gives cat a chance to have its own private time without disturbance from other home animals. The gate can be extended or shortened from 29 to 34 inches depending on the gap you need to close. It stands 36 inches high where it would be kind of hard for dogs to jump through considering the average adult weight. It's also far too tall for smaller dogs to make their way to the other side. It makes perfect sense used for indoor accessibility for cats as it has a door at the bottom part of the gate for cats and other smaller pets to pass through while keeping large home pets off access. The gate easily locks and features a 1 touch release handle in case you want to let your dogs or other pets pass through. It is made from steel where it guarantees a strong and durable product that could withstand harsh pet behaviors of different home pets. The gate can be purchased individually or on a set of 2 or a pack of 3. It saves you time and money considering you can purchase it on a bundled scale. It is constructed with solid and strong steel which makes it highly resistant against different indoor conditions or a rough behavior or pets. It's far cheaper than your normal cat door which functions that extends to restriction, limitation or containment. This is more like a cat cage that covers large space. This gate is ideally made to benefit smaller pets at home such as cats due to its doorway located at the bottom of the gate. The gate may work fine filling gaps of hallways and pathways, restricting animals from places at home but it could not be used for providing access from indoor to outdoor and vice versa. There would be same cases where athletic dogs or pets with strong legs could easily jump over a 36 inches tall gate. 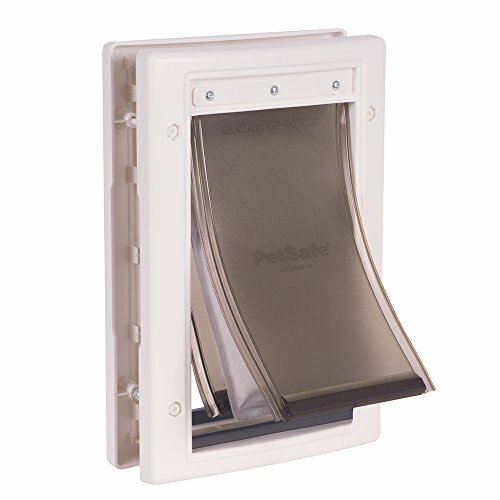 The PetSafe Electronic Door is one of the most advanced pet doors available today. It comes in different sizes depending on the purpose or specificity of the pet you wanted to grant access for. Small could fairly be used for cats and other smaller animals and medium to large would be great for dogs. The products electronic feature triggers with the help of a Smartkey. The key would be worn by your pet and would automatically detect the passing animal and trigger the automatic unlock and locking feature. It has 5 programmable Smartkey for one electronic door. This product would give you a peace of mind as it automatically locks once the animal or pet wearing the Smartkey passes through. The electronic gate including the Smartkey is waterproof. It's safe for pets and could survive wet and rainy seasons. It has a simple design of a regular cat door which requires basic installation. The Smartdoor uses 4 pieces of D-Cell batteries which actually last long. The product is energy efficient and does not require short term battery replacement. It's automated. Most pet door or cat door provides access but it requires monitoring as you would want to lock it from time to time or for each time your pet goes in for security purposes. This product saves you a lot of trouble. There are 2 sizes available, small and large. It also provides you an option to purchase the product with batteries and/or with an install kit. It may be advanced and techy but it's still fairly easy to use, program and install. One set could be used for at least 5 different pets. Over a long period of time, the sensor or the Smartkey would have some trouble detecting or synchronizing signals where the door won't lock or unlock. But that's considerable because each product would deteriorate in terms of functionality overtime. It can only cater 5 pets or animals where owning more than that would need you to purchase either another set of Smartdoor or Smartkey. The thing about pet doors is that some of it is designed for specific pets only such as cats, rats, dogs, etc. It's nice to have something that could adjust to different types of animals or pets at home. This will save you time, effort and money by installing different doors for different pet. Not to mention that you could only fit or install 1 pet door in each home door as it will consume a lot of space in the middle area of the door. Most pet doors are made of plastic, steel or aluminum. Some of the best cat doors are made of plastic but you need to make sure that it is durable, non-toxic, safe and good quality plastic. Check if the materials used are cheapened, thinned or damaged. Metal and aluminum are far more durable than plastic materials but would cause more. Either way, you just need to make sure that it could sustain and survive the behavior of your pet. Find a pet or a cat door that would be easy to install. It usually just comes with a detailed guide and a DIY installation instruction. It would take extra effort and expenses to look for someone who could manually install a pet door to areas in your house. A good pet door is usually designed for easy installation. Not to mention easy steps to uninstall and disassemble. Another important key feature you need to put into consideration is the size. Pet doors usually have different sizes varying to its purpose. It's much better if a door type or brand have different sizes available to fit your pet size. Some doors might be too small for your pet or too large where other animals might get through which is a big security issue. There are some generic or ordinary brands of pet door where it only has thin plastic doors that bends and does not feature any locks or security system. These doors aren't what you need. You wouldn't want to wake up in the morning and find out your home have been invaded by wild animals that fitted through the door. Yes. 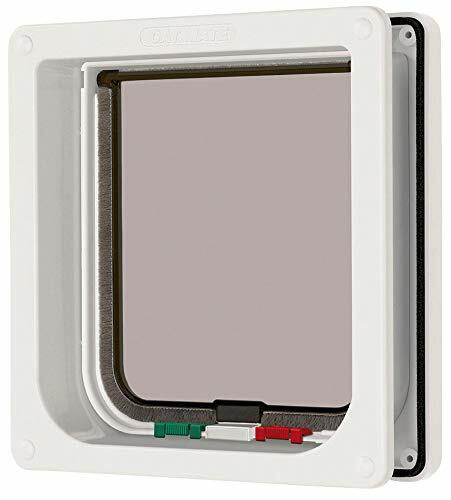 The pet door will act as a pathway connected inside and out without opening the house door. It is usually installed at the lower part of your house door but it could also work in walls, gates, etc. depending on how and where you might find it suiting or comfortable. The thickness of both varies. There is some pet door that does not have an adjustable thickness where it requires you to check and measure the thickness of your house door before purchasing the pet door. However, there are some cat or pet doors that could easily fit and have adjustable thickness where you can install it with no problems and with ease. Unfortunately, basic designs and the usual pet door are not designed for sliding doors. However, improvements and innovations have been made and there are now pet doors with panels intended for a sliding door. It is installed at the opposite end of the sliding door. The sliding door will instead slide against the panel and the pet door instead of the wall. This is the most ideal way to design it but it will shorten the wideness of your sliding door upon opening. Older designs of pet doors do not have locks but today, most or all pet doors comes with a locking system. Some even have automated locks where it automatically locks and unlocks when your pet passes through. But some prefers a door with a manual locking system as it is affordable compared to an automatic pet door. That depends on the design of your chosen pet door. There is some pet door specific for cats called cat door or dog door for dogs. However, pet doors are usually intended to cater the need of access of different types of animal. Sizes also vary with the type of pet you want to restrict access and give access. A small pet door may fit a cat but won't fit a large dog which in that case, would work as a cat door. The most probably choice for people who does not have any concerns with budget would be cat door number 3 and number 5, the PetSafe Aluminum Pet door and The PetSafe Smartdoor. However, many people find it expensive and impractical for its use wherein the most of the essential functions can be availed by purchasing a cheaper and affordable product such as the recommended number 1 product, Cat Mate - 4 way locking cat door. Either way, these are all the top products highly recommended that would give you and your pet the comfort and benefits you need at a great and affordable price. Or if your cat is an indoor type, well you could just go looking for an amazing and comfortable cat house that could work.